John Mitman has been named an officer of the for the 2011-2012 Arizona State University Young Alumni Council and also serves on the Engineering Alumni Chapter Board. 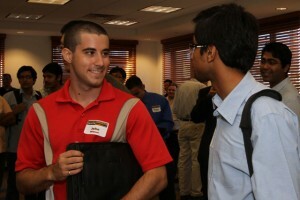 John Mitman, Mechanical Engineering ’10, has been named an officer for the 2011-2012 Arizona State University Young Alumni Council. Mitman is currently pursuing a master’s degree in solar engineering and commercialization in the School for Engineering of Matter, Transport and Energy. The council was formed in 2009 to direct development of the university alumni association’s Young Alumni program for ASU graduates age 35 and younger.